You know a skin care ingredient has star power when beauty products start including it in the name, rather than just the ingredient list. Such is the Cinderella story of turmeric, an ingredient long used in Ayurvedic medicine for its anti-inflammatory properties, but little utilized in Western skin treatments until recently. It's popping up in high-end, luxe-feeling beauty products like Kiehl's Turmeric & Cranberry Seed Energizing Radiance Exfoliant Mask, Skin Authority Beauty Infusion Turmeric & Blueberry for Brightening and Juara Turmeric Antioxidant Radiance Mask. But can this golden spice really energize, exfoliate and impart radiance on skin? Doesn't that sound like the fountain of youth itself? Here's the weirdly awesome thing about turmeric: It actually lives up to the hype, with the scientific studies to prove it. Perhaps best known as an anti-inflammatory, a 2003 study backed up turmeric's main claim to fame when researchers found it blocked the protein that causes inflammation related to stress, free radicals and ultraviolet radiation. Translation: Applying this spice can help with conditions like psoriasis, acne and dermatitis, claims further backed up by a May 2016 study. Other studies have found that applying turmeric helps retain skin elasticity and prevent wrinkles and sun spots caused by UVB rays; heal burn wounds and prevent skin cancer. According to Miami-based board-certified dermatologist Dr. Leslie Baumann, you don't have to participate in a study or buy a beauty product off the shelf -- you can make a turmeric mask yourself. "Homemade is just as good," says Baumann. And you can expect near-immediate results, with a decrease in skin redness six to 10 hours after applying a mask, says Baumann. 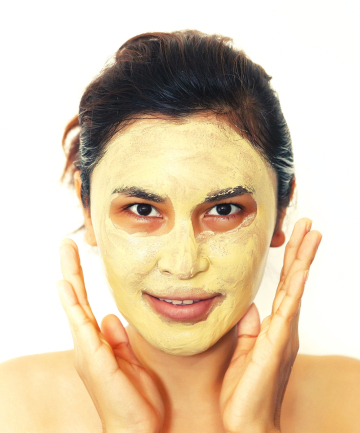 We rounded up the best turmeric homemade face masks to stop acne in its tracks, reduce redness and give you the glowing, lit-from-within skin that dreams are made of.